This integrated model on oxygen transport and ox-phos is able to reproduce experimental observations on ATP, ADP, CrP, and inorganic phosphate (Pi) levels in canine hearts over a range of workload and during coronary hypoperfusion, and predicts that cytoplasmic inorganic phosphate level is a key regulator of the rate of mitochondrial respiration. Comparison of the model simulations to experiment data on energetic phosphate compounds in cardiac tissue at varying cardiac work rate. (A.) Normalized ADP is plotted as a function of MVO2 . Solid lines correspond to model simulations of cytoplasmic ADP at different values of total phosphate pool, Dashed line represents total relative ADP mass (cytoplamic plus mitochondrial) predicted for TPP = 15 mM. (B.) Ratio cytoplasmic CrP/ATP is plotted as a function of MVO2. Solid lines correspond to model simulations at different values of total phosphate pool. (C.) Cytoplasm Pi concentration is plotted as a function of MVO2. (D.) Predicted MVO2 is plotted as a function of predicted ADP concentration in cytoplasm. Solid lines correspond to model simulations at different values of total phosphate pool. Model simulations of cardiac energetic phosphate metabolite levels and myoglobin saturation during coronary hypoperfusion. (A.) Model predicted cytoplasmic ATP concentration as a function of myocardial blood flow. (B.) Model predicted cytoplasmic CrP concentration as a function of myocardial blood flow. (C.) Model predicted cytoplasmic Pi concentration as a function of myocardial blood flow. Experimental data are divided into epicardium (epi), midwall (mid), and endocardium (endo). (D.) Model predicted mean myoglobin saturation as a function of myocardial blood flow. Beard, D.A. 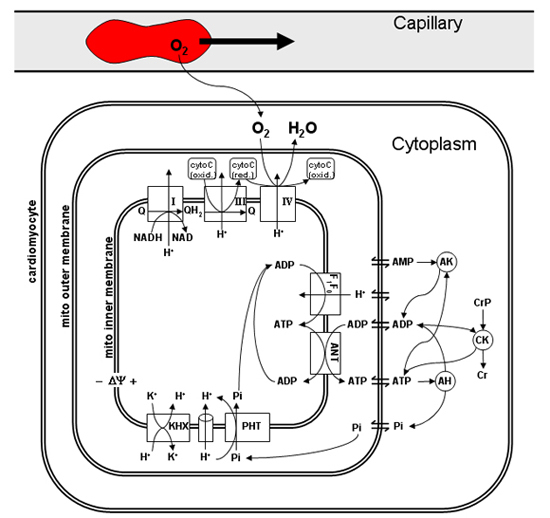 Integrated computational modeling of oxygen transport and cellular energetics explains observations on in vivo cardiac oxygen consumption and energy metabolites. PLoS Comput Biol 2(9): e107, 2006.